The most important part of this exercise, one that is downplayed both in the online survey and in a forum held on June 26 (discussed later in this article), is that regardless of which criteria and weighting one uses, some lines consistently perform well, some never appear in the top 10, and some have a middling performance. Advocates of these lines will not be happy to have their pet projects so thoroughly trounced, and they will no doubt attack the scoring system as biased. Map 1 shows all of the lines that were compared in the background work to this presentation. Some are Metrolinx “Big Move” proposals, some are parts of the city’s Official Plan, and some are from the wish list tacked on by councillors looking to prove that their wards too deserve attention. The following maps show what happens when some criteria count for more than others. In summary, although there are 24 proposals in the list (letters A-X in Map 1), only 15 survive filtering by the criteria as scored in the background study. The list below is grouped geographically. The Yonge subway extension, measured as a “Toronto” project, does not do as well as other projects. This is understandable considering where most of the project lies. 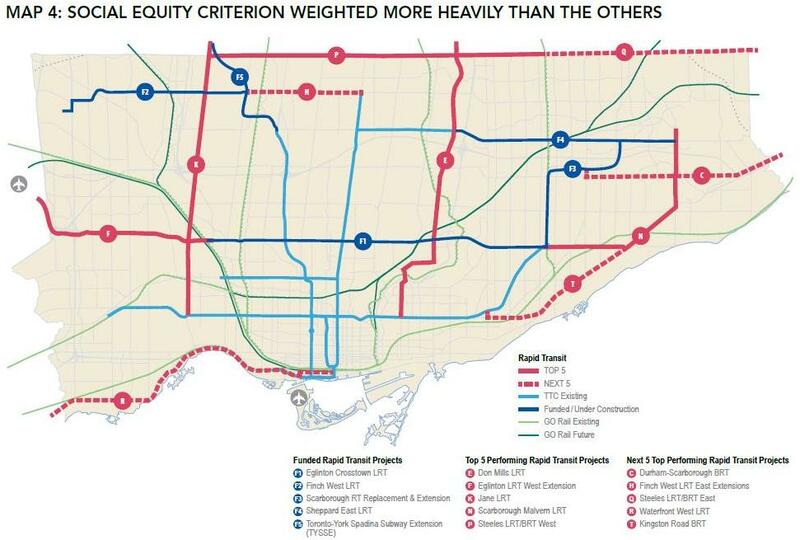 The basic DRL (south of Danforth) does well except when measured for “Equity” because its primary purpose is to bring commuters into downtown, not to serve priority neighbourhoods, none of which lie on its path. The DRL extension to Eglinton just makes the list at position 10 in some rankings, although the Don Mills LRT does consistently better. This begs a question of alternative designs given the near impossibility of an on-street alignment for the south end of the Don Mills LRT. The Transit City LRT network does quite well overall and, by their absence, has outranked schemes such as the Sheppard West and Bloor West subway extensions. 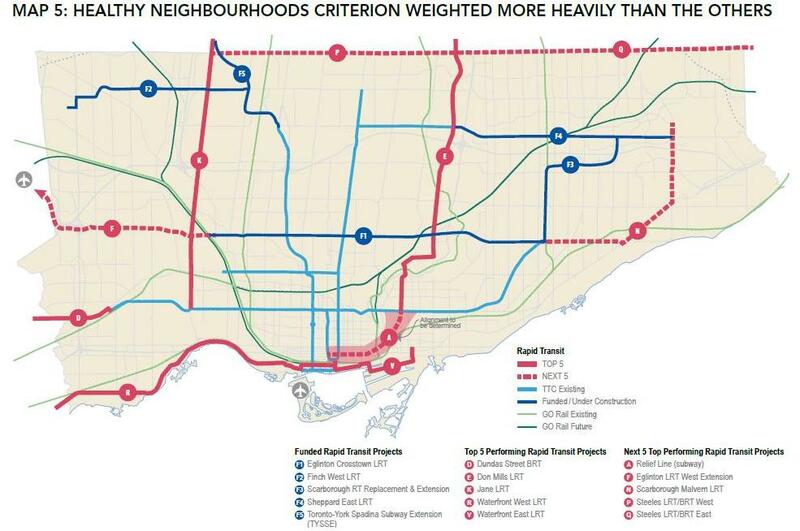 The strong ranking for Steeles adds a corridor completely ignored in previous network studies. The intent of this process is to influence Council decisions on lines it might fund on its own through, say, Development Charges (about which more in a separate article), and to set the city’s preferred priorities for the “Third Wave” of Metrolinx projects likely to get underway in the mid 2020s at best. The last debate that came anywhere near this was filled with self-serving bilge that made little contribution to a city-wide view of transit. It even spawned a provincial demand that Council make up its mind once and for all on the “Scarborough Subway” issue [Star Globe]. This is not a debate that can be safely parked as an election promise by would-be mayors, and then shelved later or left as something for which councillors can blame Queen’s Park. Notable by its complete absence from the review is any discussion of the role of ordinary surface transit — buses and streetcars — which as usual must fend for themselves even though they are the first point of contact for many riders on the transit network. Surface transit lines are the easiest to improve because they require the least new infrastructure, but they are the most ignored. In the coming 2014 budget debates, we will no doubt hear many fine words about the need to contain spending, provincial funding cuts, and the solemn duty to cut taxes. What this will do to our transit system as we spend billions in rapid transit investments remains to be seen. This forum was held at the Jane Mallette Theatre in the St. Lawrence Centre, and attracted a good, but not standing room crowd. These notes are intended to highlight issues and comments, not to provide a full record of the meeting. We began with an animated intro featuring Chief Planner Jennifer Keesmaat (available on the Feeling Congested site). It contains a few historical errors such as a claim that the Prince Edward Viaduct was built decades ahead of its time for a future subway (the intent was to build a subway in the 1920s, not the 1960s), and the size of the streetcar system is overstated a tad. Amusing, but not terribly illuminating. The important point here is that all the grand work and planning of past generations stopped dead in the 1980s. This corresponds to the first “gulf oil” crisis and the first economic and transit demand downturn after WWII. The shock of this to a generation of planners and politicians who had known only growth cannot be overstated. We have never recovered the momentum of that era. Keesmaat talked about the importance of criteria and how they matter, as well as the fact that (as shown above) many projects make the cut no matter how they are evaluated. Others consistently fail to appear. She talked about a “rational evidence-based way to meet overall transit network needs”. This is consultant-speak for telling politicians to stop drawing lines on the map of their wards. She also talked about the role of a cycling network for the entire city. If people will cycle to work, they need safety and roads need clarity about who goes where — cyclists, pedestrians, autos, transit. Alan Jones, a long-time transportation consultant from Steer Davies Gleave (an internation company active on several projects in the GTHA) talked of his experiences in other cities. His starting point was the book Urban Planning for Dummies and the observation that “moving minds” was as important as the technical content of any plan. Jones talked of his work in Dublin on the LUAS LRT system, and noted that it is so popular that there is now a “Tram” pub. This could be taken as a mark of success for future projects. In Liverpool, the “Multiple Account Evaluation” technique (the sort of thing used in the Feeling Congested background study) focussed on five areas: environment, safety, economy, access and integration. This lead to a review of not just transportation issues, but public realm designs and development links. I could not help noticing that this was an iterative process as described by Jones, not a validation exercise as this tends to be used by Metrolinx. In Sacramento, the goal was to make transit a lifelong choice, not a resented, second-class way of moving about. Jones stressed that passengers should come first. They need information, they want a route to their destination, access to transit, safe waiting areas, a predictable journey including transfers if any, wayfinding, and a return trip when they need it. Many modes could provide this type of service but the important issues are high capacity and frequency, with a 15 minute walk catchment area. Jones ran out of time before he could talk in detail about Portland and Vancouver. His presentation was interesting, and if anything showed how some work in Toronto loses sight of the larger purpose of transit, land use and urban space planning. Jennifer Keesmaat noted that the last election threw priorities into question. If we are dedicated to building a network and all the good things that flow from it, then we need a plan that is stable and consistent. Have we (City Planning) picked the right ways to make decisions? If we can agree on priorities, then we can talk about investments and build what’s long overdue. Barry Lyon argued that good planning is about ridership — crowded but not jammed. Taking lines through mature areas with little development potential is misguided. Youth and employment areas are essential, one to provide a future transit riding habit, and the other to provide somewhere for people to go. Eglinton’s LRT ending at Black Creek is an odd choice, and the line should go west to serve the airport district and connect with the Mississauga BRT. We seem to be missing the point of ridership. If planners and politicians don’t provide density, then they shouldn’t get a line. The DRL is best “decongestant” in the proposals. We face 10-15 years of increasing congestion with 50,000 new residents coming south of Bloor Street in the next 5-7 years. How will we handle their travel demands? Finally, Lyon asked whether affordability and ridership were taken into acct for some proposals, notably Eglinton. He fears “another Danforth”. What he seems to miss is that large sections of the YUS and BD subways are crammed with riders, but pass through low-rise areas of the city. They get their ridership from outer terminals and bus feeders, not from high density development on the subway itself. The concentration is at the destination, not at the origin. Mike Evans talked about a “magic pill” that can reduce all sorts of medical problems — exercise, and emphasized the walkability of neighbourhoods. There are higher rates of disease such as diabetes in areas of low walkability. Activity is a more important marker than obesity for health. Change comes from many small factors in planning for walkability, and reducing commuting distances and times. Keesmaat replied that we should make a connection between transit investment and quality of life. Next the panel got into a debate about stations and development along Eglinton. There are many players. What about development sites? Some claimed that Metrolinx will require bidders (for the coming PPP construction project) to include infrastructure for future development. That’s an odd way to put things as this should be a basic design requirement, not something we hope that the bidders include. Lyon observed that Eglinton has a problem with being an underground streetcar line with a large cost for stations. In a perfect world, Metrolinx would do land assemblies to spur development and help pay for the line. Karen Stintz talked of the Spadina extension with stations that are architectural wonders, but which have no density around them. Alan Jones noted that there is an issue of timing. Mississauga looks to recreate its downtown linked with the LRT implementation, and spoke of how Liverpool demanded development designs that would aim for high transit market share, a technique unheard of here. Evans spoke of our willingness to pay to fix things after the fact, and talked about quality of life. Stintz talked about maintenance of investment value and attractiveness (homes, businesses) comparing Toronto with Baltimore and Detroit. Anne Golden decried the level of cynicism and distrust in public, and a pervading concern about government waste as an excuse not to pay any new taxes, let alone those we already endure. Keesmaat stressed that we must shift from talking about taxes to investment. As a sidebar, she talked of a Toronto Sun reporter who no longer hates cyclists because she recently tried to cycle in downtown and discovered just what the cycling community faces. We need to move people, to shift conversations. Jones spoke of quick wins and tangible benefits. When London UK introduced a congestion charge, it simultaneously invested heavily in the surface bus fleet and service levels to show that there really was an alternative and that the money was going somewhere. Stintz observed that it costs $400 to take a family to a Raptors game, but people won’t pay a similar amount for the vague benefit of a future transit network. The discussion ended with a “where do we go now” wrapup pointing toward a Council vote in November. Anne Golden asked the audience whether they agreed with the approach taken by City Planning, and there was general agreement, although it was unclear what, exactly, they were agreeing to. Many hands were lifted in a “yes” vote, but with only moderate enthusiasm. This entry was posted in A Grand Plan, Don Mills LRT, Downtown Relief Line, Eglinton LRT, Finch West LRT, Jane LRT, Kingston Road, Scarborough RT/LRT/Subway, Scarborough-Malvern LRT, Sheppard East LRT, Sheppard Subway, Subways, Transit, Waterfront, Yonge Subway Extension. Bookmark the permalink. 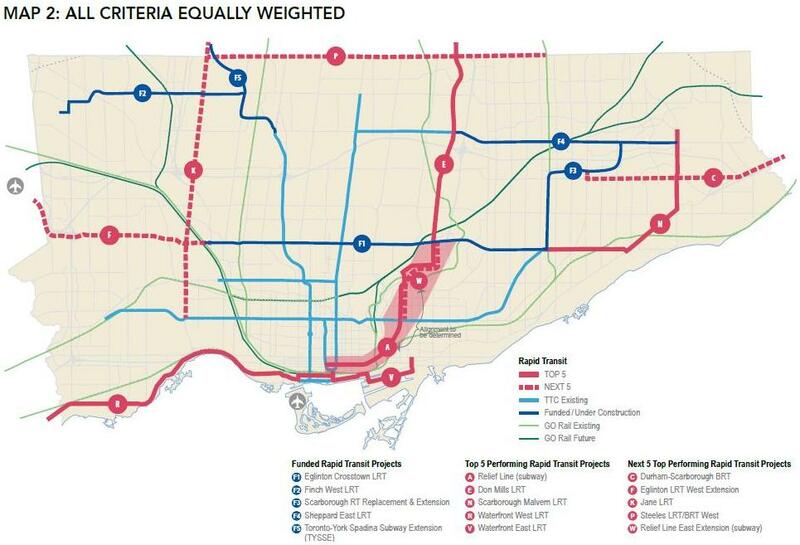 Anything along Steeles Avenue (BRT, LRT, or HRT) would have to involve York Region. In fact, any transit project that crosses Toronto borders would have to do the same, as well as paying any local costs after they cross the border. Looking at your consolidated table, there are four projects that make the Top 10 using all five metrics: Don Mills LRT, Scarboro-Malvern LRT, Waterfront W LRT, Jane LRT. Don Mills LRT and Jane LRT specifically score quite high very consistently: it would seem logical that these should probably looked at next. Waterfront W LRT, following by the Scarboro-Malvern LRT, after that. There are also three projects that arrive in the Top 10 four times out of five: DRL E to Danforth, Eglinton W LRT Xtn, and Steeles W LRT/BRT (probably in order of ranking). With this list of seven, it strikes me that perhaps the Don Mills LRT and DRL E to Danforth could perhaps be combined into one project. Given the the DVP tends to be very congested at times, having a high volume transit alternative (either LRT or subway) that runs parallel to it may not be a bad idea. Go down Don Mills, across the Don River, and perhaps Pape (seemingly the most commercial-ish of the north-south streets in the area) and connect with the Danforth line? You discussed this very possibility last year. Given the above, would a “Don Mills DRL” be the next most reasonable project? Steve: It is certainly an important project, and should be talked of, analyzed and planned as one entity, not two. However, we must not lose sight of the eastern waterfront. It does not score as highly in some schemes because it does not have a “social” purpose of connecting priority neighbourhoods, but it has an important transportation purpose of handling a high concentration of new demand over the next decade that otherwise will not be able to access the core area. Liberty Village and surrounding areas were able to develop around existing, if underserved, carlines, and waterfront west developed around the Harbourfront/Spadina services. The eastern waterfront is off on its own with only a few bus routes and its problems will become more acute as it builds out to the east. The area is too far south and spread out to be served by the DRL which, in any event, will be north of the rail corridor. I would love to see the detailed scoring to understand why waterfront west does so much better in the rankings than waterfront east. It’s inconsistencies like this that make me worry about the scoring being open to attack for giving low ratings to other projects. However, we must not lose sight of the eastern waterfront. It does not score as highly in some schemes because it does not have a “social” purpose of connecting priority neighbourhoods, but it has an important transportation purpose of handling a high concentration of new demand over the next decade that otherwise will not be able to access the core area. While it might be nice to get ahead of development for once with the eastern waterfront, there are plenty of places with concentrations of demand right now. I think it could be argued that we should catch up with the hot spots we currently have, and not worry about future build up until it actually happens. I’m not sure this argument would be 100% correct, but I’d certainly be very sympathetic towards it depending on what other projects it’s being pitted against. The one thing that I don’t see in any discussions is the GO Train Network for in town use. The GO Train Service is almost exclusively for the benefit of 905. A few more in town stops would give Torontonians an express service at a fraction of the cost of new TTC LRT’s. A harmonized fare system between GO and TTC that would allow transfers would be great and it would be something that would happen in years, not decades. I would think that electrification and double tracking of existing GO Train Lines would be much cheaper than tunneling through the downtown core to create any relief line. Steve: The issues you raise will be part of the Metrolinx studies of (a) how the GO network can address some of the demand that will be faced by the Yonge subway and the proposed Relief Line, and (b) how services and fares across the region might be integrated. Although the city study looks beyond currently funded projects, a few in that list like the DRL are also in the Metrolinx “Next Wave”. They are unfunded, but certainly Metrolinx priorities. Whether a city list with significantly different priorities from Metrolinx will have much effect on the Next Wave remains to be seen. The challenge here is knowing where to stop building the DRL once we get to Bloor. Tail tracks will take the line some distance to the north of Bloor but not to the Don River Valley. The Don Mills LRT can be built to Eglinton and further south to the Don Valley but it would not be able to use the existing bridge to cross the valley and the right-of-way south of the valley is too narrow. In a way we have a situation similar to the Jane LRT where the section north of Eglinton needs to connect to the Eglinton Crosstown LRT before it connects to the subway. Here we can build an LRT north of Eglinton and a subway south of Bloor but cannot decide on the section in between. One big question is whether the ‘Don Mills line’ can be built in two separate sections with two technologies as long as the ultimate goal is a more-or-less seamless connection at Eglinton. The other question is whether it is better to spend the money to get the DRL subway north of Bloor and across the Don River now rather than in the future when it will cost more money. It will be interesting to see if/when/how the evidence is presented to justify a decision about that segment in between Bloor and Eglinton. Steve: I have argued for some time now that the section from Danforth to Eglinton may as well be a full subway as it will have to be completely grade separated at least beyond Thorncliffe Park, and would also be underground crossing Eglinton. If there is a subway coming north from downtown, it may as well continue. This also reduces transfer load at Danforth by making through trips from points north to downtown. Don Mills and Eglinton is a logical “Mobility Hub” and should be planned as the interchange between the Eglinton, Don Mills, and Relief line, not to mention feeder bus routes. It has the benefit of being a natural growth node and having the property needed to accommodate a major interchange. While I appreciate David Magda’s opinion that some parts of the City need better transit now; I would argue that the eastern waterfront line as currently planned (Cherry to Union) is a good investment and putting it in soon will allow Waterfront Toronto to continue to “put transit first’ and set people’s patterns. The line is really not very expensive but it is the first step in a network that would (next ?) connect through the rail berm to the Cherry Street LRT and then on to the Portlands. It’s the first step in a lakeshore east network. The area from Yonge to Cherry is developing fast and, as Steve says, has very poor transit now and without the most expensive part of the Waterfront East line (the tunnel to Union) it really cannot be improved much. This analysis is not very well done. This makes the same mistake of the Transit City studies in considering meaningless criteria like “priority neighbourhoods” rather than actual transportation needs. 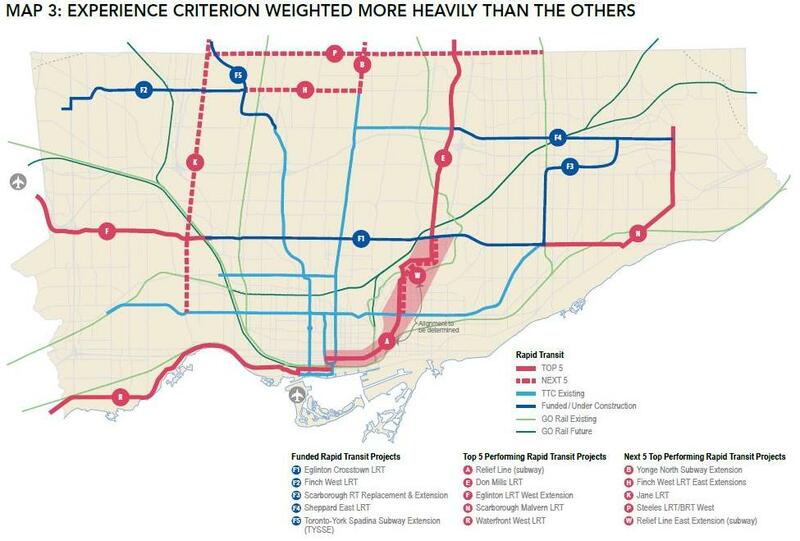 First of all, it ignores any transit lines outside of city limits and completely ignores the GO train system. Secondly, it makes absolutely no sense to put light rail on the north end of Don Mills while putting subway on the DRL. We do not want to create an unnecessary transfer here, and also the DVP/404 is busier north of Eglinton than south of Eglinton (typically during off peak times DVP/404 is congested northbound between Eglinton and 401 and southbound between Finch and Eglinton). Third there is a need for a continuous high capacity line paralleling the 401 and running through the high density areas that run parallel to it, that is why I think that both Eglinton and Sheppard should be subways. The GO Train Network seems to be a sacred cow and/or Torontonians are wearing blinders as to its potential. Steve: Until quite recently, the problem has been Metrolinx/GO who refused to discuss this potential and left Toronto having to plan as if GO didn’t exist within the 416. This appears to be changing now that Metrolinx has launched a study of options for serving York Region and north-south traffic generally with a mix of “rapid transit” including GO. Thanks to the Simpsons, Monorail always ends up as a punchline. However, it is less expensive than tunneling for complete grade separation. You could run a Monorail along the 401 with very little impact on the traffic below. I’d like to see Monorail discussed as an option for the Jane Street LRT. Connect at Old Mill and run up the Humber River and Black Creek Ravines. Steve: If you want to discuss a monorail running up Jane Street, we can have a serious discussion, but running through a park system wandering up to York University is simply not going to happen. We are no longer in the 1950s. That’s not even remotely true. Toronto generates more GO Train riders than any other municipality, with the exception of Mississauga (I’m excluding Union, of course). Toronto has 18 stations other than Union, so the ridership at each station isn’t very impressive – hence the perception that lead to comments like these. GO runs services on the Lakeshore West, Lakeshore East and Stouffville lines that make only make one stop in the 905 – those are primarily for the benefit of Toronto residents. I have argued for some time now that the section from Danforth to Eglinton may as well be a full subway as it will have to be completely grade separated at least beyond Thorncliffe Park, and would also be underground crossing Eglinton. If there is a subway coming north from downtown, it may as well continue. This also reduces transfer load at Danforth by making through trips from points north to downtown. Don Mills and Eglinton is a logical “Mobility Hub” and should be planned as the interchange between the Eglinton, Don Mills, and Relief line, not to mention feeder bus routes. I would call that a great example of using examples and reasoning including experience and understanding of best practices. I’m confident that you have estimated numbers (demand projections, cost benefit analysis, projected construction costs) that would support your arguments and they would be available for discussion if asked). All those arguments are also strong but I’d be interested to see stronger evidence and reasoning. Not studying lines outside of Toronto might be an expression of the limits to the scope of Toronto city planning … and a clear indication that the priority of the City of Toronto’s planning department is currently focused on the needs of Toronto rather than the GTHA (which is effectively operating in a regional planning vacuum with nothing except the Places to Grow Act). 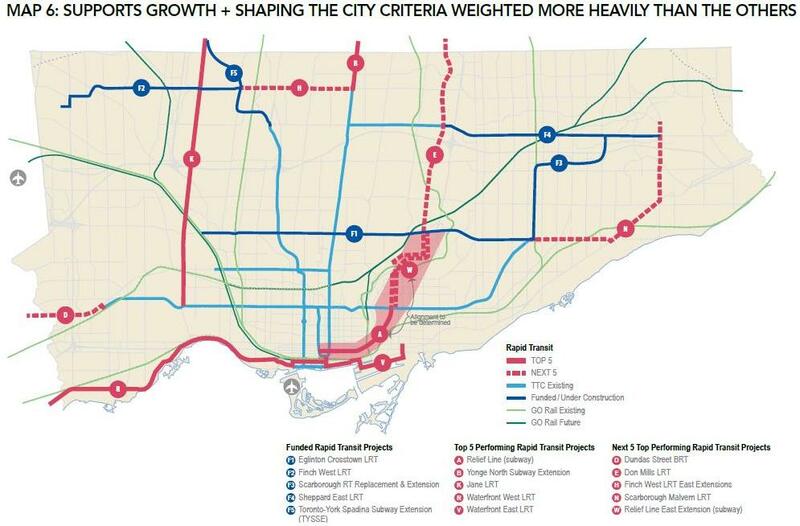 Cost-benefit analysis for both the Sheppard and Eglinton corridors combined with the City’s development plans for both corridors show that only LRT capacity is necessary. The Eglinton Crosstown line trains will carry more people than the current Sheppard line trains do. City planning staff have also put any westwards extension of the Sheppard corridor (either as a subway or LRT) well down in the list of recommended projects. The whole point of “Feeling Congested” is to develop and provide an implement an evidence-based approach to prioritizing transit plans. If that is going to be the way that recommendations and decisions are going to be made (Councillor pet projects and politicking notwithstanding) then we have to come forward with evidence too. 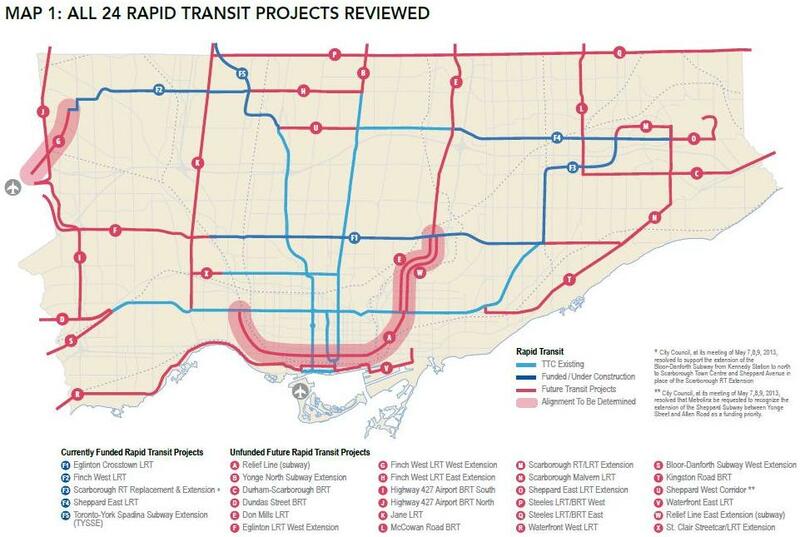 This series of Rapid Transit Project maps is very interesting & enlightening. I agree with the comments about the validity of the various criteria and how they weigh, but that is exactly the problem in setting fund & build priorities. This is, at least, an honest attempt for starters in my opinion. Some items that I note, which really never went into much public attention before: a Jane LRT, Scarborough-Malvern LRT, Eglinton LRT extension westward, all received a boost. As well, I note that the map #1 draws a particular line for the DRL West which seems to take a route at or near King Street West and which then picks up the rail corridor ending at Bloor. This is in contrast to previous maps showing a proposal for a subway going up Roncesvalles Ave. I had previously posted that Roncesvalles should retain the streetcar, due to its Village character. It is moot, because DRL West did not rate in the top 10 on any criteria. That’s ok! I have argued for some time now that the section from Danforth to Eglinton may as well be a full subway as it will have to be completely grade separated at least beyond Thorncliffe Park, and would also be underground crossing Eglinton. If there is a subway coming north from downtown, it may as well continue. This also reduces transfer load at Danforth by making through trips from points north to downtown. Don Mills and Eglinton is a logical “Mobility Hub” and should be planned as the interchange between the Eglinton, Don Mills, and Relief line, not to mention feeder bus routes. It has the benefit of being a natural growth node and having the property needed to accommodate a major interchange. I agree 100%. So, what about between Eglinton and Sheppard? The Sheppard subway ends at Don Mills Station, and so will the Sheppard East LRT and the Don Mills LRT at the same location. Maybe the two LRT lines connect? Or, if Don Mills from Eglinton to Sheppard were serviced by subway, then it would really extend the Sheppard subway all the way to downtown! The beauty of Don Mills Rd between Eglinton and Sheppard is that it is such a wide street, with potential for even wider. How about if the stretch between Eglinton and Sheppard were serviced by BOTH subway and LRT? The subway could be express, stopping only at major stops. And both subway and LRT could share the same track, saving $millions in construction and operations!!! All is needed is a separate track diversion only in places where the subway needs a platform. Of course, powered by 3-rd rail and overhead cable for either. Oh, darn, darn, darn! Can’t do that: Metrolinx has decided to use non–TTC gauge on the LRT system. What a screw-up. Steve: At some point, the Don Mills line may go further than Sheppard. We cannot build subways all the way to Barrie. If you could post the origin-destination studies you’ve done that show Metrolinx and the TTC are wrong to disagree on this point, we’d all be grateful. Steve: I too would love to see where these “high density” areas beside the 401 are. Most of it is surrounded by medium to low density sprawl and parking lots. Yes there are towers, but on nowhere near the scale one associates with a subway. Metrolinx is asking/demanding reassurance the TTC is going ahead with changing the SRT to LRT and not trying to change the choice. Here is a suggestion. Leave the SRT as is. Do nothing with it. Redirect the dollars elsewhere for transit. Let us see how long it will last. How much more life can be had from the present equipment. I’ll bet it could be given a life extension a lot cheaper than building new LRT. The when it finally breaks down change over those articulated buses that Doug Ford thinks are so great. Assuming he is still around when it finally does break down. I am willing to bet a week’s pay he will be long gone! Making Pape/Danforth the main (and only) intersection point between the DRL and the Scarborough travelers would overwhelm that station since it would be difficult to turn the existing station into a major interchange. By extending the DRL to Elinton, it would allow the Scarborough traffic to be split between the two transfer stations. Unfortunately, the planned station at Kennedy will transfer all the riders onto the Danforth subway, negating (much of) the benefit of the DRL going north to Eglinton and continuing to have a big problem at Pape station. By running SRT trains all the way along Eglinton (grade-separation would be required – most likely elevated), the Scarborough riders can be funnelled to the DRL at DM/Eg, where is would be much easier to build a major interchange station. The extension of the Don Mils subway north of Eglinton is not (just) to satisfy local demand along Dom Mills, it is to better relieve Yonge. Lawrence, York Mills, Sheppard, Finch and Steeles East buses dump a lot of passengers onto the Yonge line that could be intercepted by Don Mills. Even some of York Region riders could be diverted. If we closed the Spadina subway and had all the west buses go to Yonge, everyone could tell that the Yonge line would see a lot more riders – so it should be obvious that the same argument holds in the east. Thanks, I wasn’t aware of this and I think that I may have a common perception. Although the GO Train Stations say that they connect with other transit, its not like TTC buses pull right up to the Station. You usually have to hike a block or two to get from a bus to a train. Steve: The detailed station level counts from GO do not appear to be available online. Tom — can you provide a link to this information? Steve says:If you want to discuss a monorail running up Jane Street, we can have a serious discussion, but running through a park system wandering up to York University is simply not going to happen. We are no longer in the 1950s. Monorails are a tough sale. People will be hard pressed to have transit riders looking in their second story windows. That’s why I chose the scenic ravine route. If you think that there’s a slim chance that a MonoRail could be chosen over tunneling in any part of this city, I’d like to know. Perhaps the Eastern DRL following the DVP. Steve: But the DRL won’t follow the DVP because, leaving aside the difference in levels (I am looking out my window at the Don Valley and the PEV as I write this), any connection has to be far enough east that transfer traffic from the DRL to the Danforth subway outbound has a chance of getting on the trains. Even at Broadview, this can be a challenge. I have just finished the “Feeling Congested” internet poll at http://www.feelingcongested.ca/#have-your-say and trust that you will be vociferous in your opposition to any Council consideration of such a sleazy push-poll. Virtually every criteria includes the pseudo-metric ‘walking distance to station’, a total irrelevancy when compared to the obvious goals of reducing commute times and congestion in general – neither of which are granted any role in any of the criteria. The intellectual dishonesty in the capital cost metric of up-front cost vs. total projected ridership in 2031 is breathtaking. There is no allowance for the expected capital life of the assets, and the capital maintenance costs of the assets is similarly disregarded. It is quite clear that the poll is a charade, using irrelevant and dishonest criteria to load the results in favour of a predetermined choice of LRTs – in much the same way as reports commissioned by Council in 2012 were transparently dishonest. Steve: You are entitled to your opinion, but it’s amusing that if anything, your arguments tend to favour BRT the most because it is the least capital intensive. If people had to pay for the capital cost of subways, including capital maintenance, as a visible cost, none of them would ever be built. People are fond of claiming that subways outlast LRT by a factor of 3. This, quite bluntly, is a lie. It is the subway tunnel structure and stations that are built for longevity, but the track, vehicles and major subsystems wear out at the same rate regardless of the type of vehicle. If subway cars lasted 3x the LRVs, we would still have Gloucester trains plying the Yonge subway line. We agree only in that the poll is poorly designed, but not about your underlying claims. You are entitled to your opinion, but it’s amusing that if anything, your arguments tend to favour BRT the most because it is the least capital intensive. Actually, if capital cost was the only consideration, it would be cheaper to buy everybody in Toronto a pair of running shoes. The costs involved must be examined in light of the objectives. What is the objective of new transit construction? To increase the number of people living within walking distance of a non-bus, non-streetcar transit stop? Or to address the enormous costs of congestion? People are fond of claiming that subways outlast LRT by a factor of 3. This, quite bluntly, is a lie. Is it a lie? It depends on how you count, doesn’t it? There are assuredly some parts of a subway that wear out just as fast as other options (for instance, the light-bulbs), but there are other things that wear out much more slowly – such as the tunnel itself, which comprises the lion’s share of the initial cost. One way or another, it’s a meaningless claim and a meaningless discussion. What is required is an honest accounting of capital costs, terminal value (by the survey’s metric, there is no difference between the depreciation rate of any transit component), and capital maintenance. Claims? The only claim I am making is that the methodologies referenced in the poll you very gently refer to as ‘poorly designed’ is in fact designed to produce a result favourable to LRTs – the metrics “walking distance to station” and “up-front cost per projected passenger” are nonsensical. And this is what makes me suspicious: If the best effort the pro-LRT forces can come up with looks like a straw-man in a first-year B-School assignment, I have to suspect a cover-up. If you truly believe that LRTs are the best option when examined on an objective basis, that there are good, solid arguments that can be made that support LRTs over subways as the focus of new construction, you should be as angry regarding the methodologies therein as I am. Oh here we go again. This is about the third time you’ve come around here making your selectively “objective” thoughts. Tunnels and stations, once built, do not exist in stasis. The one thing that comes to mind is water infiltration. There is always water coming from above and seeping into the tunnel and station structures which leads to constant maintenance which BRT and LRT (the above ground variety anyway) does not have to deal with. This requires constant upkeep and yes money. I don’t even recall you ever acknowledging the capital and upkeep (“life cycle”) costs of ventilation equipment and station components such as elevators, escalators, and buildings. Troll on. Steve: I presume that this is not directed at me, but at James Hymas. In fairness, he does talk about the need for capital maintenance, but somehow twists this into an anti-LRT argument giving the impression that somehow subways, even with their immense infrastructure and operating costs, have not been given a fair shake. I would be absolutely fascinated to see an analysis of capital maintenance and operating costs for all forms of transit. Dr. Chong claims (citing the Sheppard Extension environmental assessment) that the break-even time for a subway is about 21 years. He does not provide any numbers. Mr. Munro claims that the Chong report is a load of hooey. He does not provide any numbers. It may well be that LRTs are the best thing for Toronto; but there are no numbers. There are ludicrous metrics that have nothing to do with the problem at hand (such as the “population within walking distance of a non-bus, non-streetcar stop” and “up-front cost per projected passenger”, referenced above) and there are dishonest reports (such as those that implicitly claim uniform depreciation of every single capital asset used in transit) … but no numbers, no discussion of the assumptions behind the numbers, and no chance for any member of the public to form a considered opinion based on solid data. I visited this site again because I wanted to see if Steve had any commentary regarding the latest twist in the Scarborough RT/Subway/Political Football kerfuffle. This problem is quite normal for debate regarding transit in Toronto: cost estimates are off by a factor of nearly two, but there are no numbers supporting these estimates. Presumably the powers that be will decide the question in a back room somewhere and we’ll take what we’re given and pay for it gladly. After all, there has never been a single mistake made regarding infrastructure choices anywhere in Canada, and corruption is equally unknown. While looking for commentary on this issue, I saw this most interesting OP and investigated further. I was outraged enough by what I saw to eMail my councillor (and later, the mayor) and to post these thoughts in the hope of sparking some discussion; perhaps of convincing others to share my views and apply whatever political pressure they could on their councillor and the mayor in favour of an honest debate with hard numbers and benefit metrics that have something to do with the transit problems we actually face. As far as I can tell, L. Wall is claiming that anybody who would like to see some numbers in the context of an honest debate is a troll. This is quite normal for debate regarding transit in Toronto. So be it. However, I am most interest: does L. Wall agree with the methodologies outlined in the poll? Does (s)he agree that “up front cost per projected passenger” is a wonderful cost metric? Does (s)he agree that “population within walking distance of a station” is an ideal benefit metric? Inquiring minds want to know. Steve: The issue is not only the up front and life cycle capital and operating costs, but also the demand that will be put on a proposed line. There are levels above which buses (with very specific, line-haul implementations) cannot be reasonably operated, and another upper bound to LRT. These are fuzzy boundaries and at times other factors such as network structure or construction issues force certain choices. I’m not going to get into a debate on your issues, not because I don’t agree with the premise of the question, but because I don’t think you really want to hear the answers. Transit costs a lot of money, and the more concentrated the demand is, the higher the level of technology and associated cost the system must bear. Too much of this debate has turned on the so-called hurt feelings of Scarborough which is being convinced that the elite downtowners are out to deprive them of a subway. I wonder what your economic analysis would do to their aspirations? As for the current Metrolinx/TTC/City debate, an article is in the works. Be patient. Unlike some people, I prefer to get a sense of what is going on before I write rather than after. Too much of this debate has turned on the so-called hurt feelings of Scarborough which is being convinced that the elite downtowners are out to deprive them of a subway. Earlier today Karen Stintz was tweeting that Metrolinx had made a commitment to spend 1.8 billion in Scarborough (and presumably must spend that money in Scarborough even if Council has decided they don’t want the LRT anymore). 1.8 billion would buy a lot of upgraded GO service on the Stouffville and Lakeshore East GO lines and an an extension of Eglinton east towards Guildwood too. There’s also that plan for an Ellesmere BRT. In other words, be careful what you shill for. The issue is not only the up front and life cycle capital and operating costs, but also the demand that will be put on a proposed line. I do understand that a cost-benefit analysis includes not just the costs, but the benefits. These require just as much analysis – a certain amount of fuzziness can be expected, but reasonable people can disagree. I always think it pleasant to understand just what it is I’m expected to agree or disagree with; but sometimes this does not seem to be possible. I don’t think you really want to hear the answers. Well, I don’t know where you get that impression; virtually every comment I’ve made on this blog has been a complaint that no substantive issues are actually being debated. I guess my error was actually reading the Chong report, learning that it claimed a 21-year break-even for subways (i.e., higher initial capital cost is balanced by lower capital maintenance and operating costs) and trying to learn more about those claims. I’ve gotten lots of vilification for that. I’ve heard lots of assertions that he’s just plain wrong. Comprehensive analysis, not so much. I wonder what your economic analysis would do to their aspirations? I wonder about that too. But it looks like we’ll never know, because economic analysis is even more unpopular in this venue than it is in Toronto city politics. One very tricky question is fundamental: what is transit for? Why should anybody be taxed for transit and be perfectly happy with that? I have a friend who lives in Scarborough and who often has to work downtown – she virtually always drives, because transit is so darn slow. You could put LRTs on every street in Scarborough, with a station inside her apartment building and she wouldn’t take transit any more often – because it would still be slow. Put in a subway that got her downtown fast (not having to transfer at Kennedy would help a lot) … she’d take it more often. The metric she uses for the value of transit is not “how close will I be to a station?”, but “how fast can I get downtown?”. That’s why she wants a subway – that’s why most Scarberians I know want a subway. It doesn’t really matter much whether a short trip takes 10 minutes or 20; it matters a lot whether a long trip takes thirty minutes or an hour. So a fundamental consideration in any cost-benefit analysis is how to structure the benefit side of things. Is it supposed to be “rapid transit” or is it supposed to be “station within walking distance transit”? I suggest that the problem we face in Toronto is congestion; Metrolinx claims a cost of $3.3-billion to commuters and $2.7-billion to the economy as of 2006 with both figures more than doubling by 2031. I do not take a view on the accuracy of the report, but I suggest that it would be a good starting place for a benefits analysis, i.e., Benefit = Net Reduction of Present Value of Congestion Costs. Yes, it will be fuzzy. There will be modelling assumptions to make and projections to estimate and reasonable people will disagree. But at least there will be something to disagree about. I’m not sure whether you or anybody else agrees with me on that; sadly, my intent to spark a discussion regarding the methodologies suggested in the “Feeling Congested?” poll met with no success whatsoever. I am still in the dark regarding whether or not I am the only one here who thinks “population within walking distance of a station” is, at best, a very minor metric, to be accorded a very low weight. Steve: Well, to stake my position, I will say that population within walking distance is important, especially as a tradeoff to attempting to give everyone a super-speedy trip. The question is the total trip time including access, wait, travel and transfers if any. And, by the way, everyone in Scarborough is not going downtown. Yes, many, but not all, and it would be nice to have some money left over to build something for them too. Your friend prefers to drive downtown. That drive, unless it is at off hours, has its own challenges on the expressways and local streets, not to mention the cost of providing a parking space at the destination(s). A subway will only get her there really quickly if she is close to it (low access time) and otherwise she faces a bus trip of dubious reliability (the very thing Scarberians hate about the TTC). I have big problems with the “congestion costs” and claims about how these will be reduced. Even Metrolinx admits that the entire Big Move network will at best keep things from getting worse, and that’s on average over the region. Some places will be a lot better off, but some will just continue to clog up. There are similar methodology problems with pollution calculations that are averaged over the entire GTHA. And that’s all I will write for now. I will say that population within walking distance is important, especially as a tradeoff to attempting to give everyone a super-speedy trip. The question is the total trip time including access, wait, travel and transfers if any. I quite agree that the total trip time is the important issue; this will feed directly into my suggested benefit metric that computes the benefit as a direct function of time spent travelling. Certainly, being within walking distance of a higher-order transit stop will decrease total trip time, all else being equal (and thus increase the computed benefit) but I see no need to accord extra weight to this component of the total trip time. And, by the way, everyone in Scarborough is not going downtown. I quite agree. We are seeing some recognition of this situation in Paris, where they are moving from a hub-and-spoke system to a more networked system. However, the problem I want solved – or at least mitigated, to the greatest extent possible given availability of funds – is congestion in Toronto as a whole. If my choices are between saving 10,000 people 20 minutes each per day, or saving 50,000 people 10 minutes per day, I will go for the latter, every time. And I suggest that there are far more Scarberians heading downtown – or in that general direction – than there are on any other route; this not only takes up their own time, but in adding to congestion along this corridor, they also increase travel times for other people along the way, which I suggest will not be as big an issue for those travelling to other destinations. I want the biggest bang per available buck possible, and I suggest that is almost certainly to be found by improving the Scarborough-Downtown connection. But I retain an open mind on this: if it can be shown that improving some other route will result in a better cost-benefit ratio, I’ll go for that one. Yes, many, but not all, and it would be nice to have some money left over to build something for them too. Nice, yes, but I’m not going to support a tax increase if all it does is be nice. A city is all about doing business. Without business, we’re just too many people on too little land, starving to death, and that has been the case ever since the first city was built. A municipal government’s main job – ideally, its only job – is to facilitate business being done in the municipality. If my $X tax will facilitate business best by improving – say – Scarborough-Agincourt connections: great! But if business is better facilitated by spending every penny of that $X on improving Scarborough-Downtown: better! The desire to be nice is, I think, a large part of the reason why Transit City was developed, and a greater part of its rationale than facilitating business within the city. I quite understand that in order for plans to be executed, politicians have to vote for them; and that in order for politicians to vote for them, politicians need to be elected; and that in order for politicians to be elected, they have to promise to be nice. However, I will oppose any plan that has niceness as a critical element in its adoption – I don’t pay tax so some other guy can get elected: I pay tax so I can do business better, and so that the people with whom I do business can do business better. Your friend prefers to drive downtown. That drive, unless it is at off hours, has its own challenges on the expressways and local streets, not to mention the cost of providing a parking space at the destination(s). Oh yes, all that’s factored into her own personal cost/benefit analysis; it’s factored into everybody’s cost/benefit analysis, even if they don’t call it that and can’t articulate the decision-making process in any kind of formal or consistent way. At the moment, with a one-hour / half-hour travel time estimate, she is firmly in favour of driving; but it is not necessary for travel time via transit to be reduced to thirty minutes to tip the scales. Perhaps she would take transit if the alternatives were 50/30; perhaps other people will only change their decision at 40/30. It calls for some good quality modelling, with the assumptions and arguments laid bare and subject to challenge … which hasn’t happened. A subway will only get her there really quickly if she is close to it (low access time) and otherwise she faces a bus trip of dubious reliability (the very thing Scarberians hate about the TTC). It may well be that a better cost/benefit ratio can be achieved by improving access times to the subway, rather than by increasing the length of the subway itself, but I have never seen the argument framed in this manner. It’s all been about niceness, with Council seeking to facilitate the bucolic lifestyles of the quaint Scarberians as they happily travel the two stops between the Organic Fair Trade Granola Store and the Vegetable Seeds For Kitchen Gardens Centre. While singing. If I can be shown that, using reasonable models and assumption, reducing subway access times via LRTs provides a bigger bang for the buck (as measured through reduction in congestion, now and in the forseeable future) than the alternative of lengthening the subway (or any combination of the two, of course) – I will be all for LRTs. But I have never been shown this. To be fair, I’ve never been shown the opposite, either. I have big problems with the “congestion costs” and claims about how these will be reduced. Fair enough. I have an open mind; I don’t regard the Metrolinx report as Holy Writ. Show me your objections and your suggested alternatives and I will be very pleased to consider them. I met you in the Feeling Congested talk. It was great meeting you and Paul Bedford, who taught me urban planning in U of T.
Well, you see, having good public transit is not cheap and is well worth the increased taxes, even if it is increased by 0.5%. Seems I opened whole can of worms here. My question would be if LRT revision is possible what could be done: better, more cost effective etc. Some would say LRT isn’t the way to go then if you’re looking for a cost effective way and therefore should go with BRT. I think it’s a mistake, a big one. A few reasons, from a transit perspective, buses in Waterloo Region have a stigma attached to them, LRT at least would provide something different and new and there would be a lot of hype around it, buses not so much. From a development perspective, LRT lines and stops are fairly permanent, people can (and will) build around them, bus routes can change easily. So are there things we can do to make it more cost effective? Probably. Significantly cheaper? Probably not as long as you’re staying with LRT. As for “better” I’m not entirely sure what you had in mind. Cambridge residents would say it would be better if they got the service, or didn’t have to pay for it. The cost is the main thing holding the entire project back right now.